I started having an alignment issue yesterday. I would scan a location, move to the next, and then the next. The middle location would not stitch, however the next location would. The second location has more data to stitch to than the 3rd location, yet it would not work, but the 3rd would. Very strange. Only just started happening after the last app update, but happened maybe 8 times within 30ish sweeps. Jamie, I have been having similar issues. 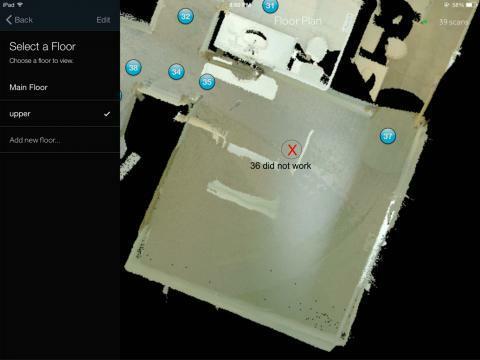 And also having issues with not being able to move from one scan location to other in some situations. Also earlier today I was checking out a scan on another website and couldn't get from the kitchen to the hall or visa versa. In fact when in the hall way you couldn't even see the scan locations on the floor and you couldn't enter the room. I have shared this with support. In a recent support email they shared that "While your camera is running the appropriate version of firmware based on its date of manufacture, a newer version will be available to you as soon as the camera firmware update procedure is released to the general population. To clarify the recent update of the capture application has the ability to update camera firmware however this feature is still undergoing testing ad has not yet been enabled." Interesting. Thanks Charlie. I will email support as well and see what they have to say.